Senate Democrats say they have the votes to formally disapprove of the FCC's Internet policy that will take effect next month. Here, supporters of net neutrality protest the decision to repeal the Obama-era rule. Critics of the FCC rollback say they're worried about consumers being forced to pay more for less consistent or slower service. FCC Chairman Ajit Pai, part of the Republican majority, has said the Obama rule was "heavy-handed" and isn't needed. Markey described a coalition of Internet voters who bridge the usual philosophical party lines when it comes to government regulation. "The grandparents, the gamers, the gearheads, the geeks, the GIF-makers, the Generations X, Y, and Z. 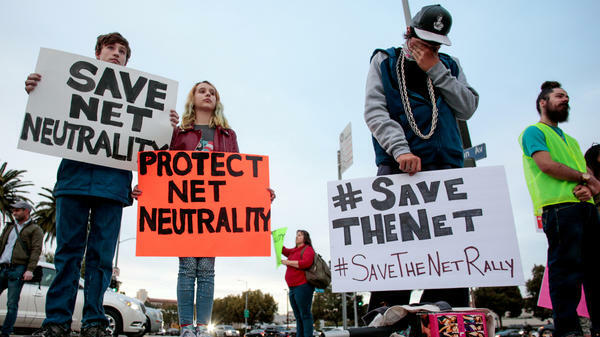 This movement to save net neutrality is made up of every walk of American life," he said. Republicans overwhelmingly support ending net neutrality because they want to shift regulatory power away from the federal government and toward the private market. Republicans also argue that Democrats are playing on unfounded fears that Internet service providers will jack up costs and anger their consumer base. "If the Democrats want to run on regulating the Internet, I think that's a losing strategy," said Sen. Cory Gardner, R-Colo., who runs the Senate GOP's 2018 campaign operation and voted against the resolution. This issue doesn't cut along clean party lines, said Steven Kull, who runs the Program for Public Consultation at the University of Maryland and has studied public attitudes on net neutrality. The program's research has found that majorities of Americans support government-mandated net neutrality protections. "People are on the Internet a lot and it's a big part of their daily experience and the prospect that it will be changed in some fundamental way is disturbing to quite a lot of them," Kull said. Fear is a great motivator for voters. Senate Democrats believe their resolution that put every Democrat on record in support of net neutrality — and most Republicans on record against it — can turn what was once considered a wonk issue into a wedge issue this November. "People underestimate the passion of Internet voters, at their peril. They are mad, and they want to know what they can do, and this vote will make things crystal clear," he said. Republicans like Rep. Scott Taylor of Virginia think Democrats are wrong on the policy of net neutrality and that eliminating FCC rules will expand competition and consumer choice. However, he concedes that Democrats have done a better job of selling their message to voters and says there could be consequences if Republicans don't engage more directly with voters on an issue they care about. "It's important Republicans have a clear and concise message to tell them why net neutrality, while it sounds good, and maybe it's even well-intended, is not the right answer for them," Taylor said. Net neutrality doesn't make for catchy campaign slogans, but there are indicators that voters are clocking this issue. According to data provided by Google, net neutrality regularly ranks among top political searches in each state. In Pennsylvania and Nebraska, which held their primary elections on Tuesday, it ranked second in political searches behind health care. "This is one of those areas where Washington, D.C., sometimes gets in a bubble and doesn't recognize what's going on in the rest of the country," said Sen. Chris Van Hollen, D-Md., who runs the Senate Democrats' 2018 campaign operation. Kull is more skeptical that net neutrality will be a potent voter motivator this year unless people start to see changes to their Internet costs, speed or access. Voters may know soon enough: The Obama-era net neutrality rules expire June 11. Democrats enjoyed a rare victory on the Senate floor today. Over the objections of the Republican majority, the Senate approved a resolution to reverse the Federal Communications Commission's decision to end so-called net neutrality rules. With no support among House Republicans to do the same, the legislative fight ends today for Democrats. But NPR congressional correspondent Susan Davis reports Democrats will carry the political fight into this year's elections. SUSAN DAVIS, BYLINE: When it comes to Internet access, Democrats like Massachusetts Senator Ed Markey see a new coalition of voters forming that bridges the usual philosophical party lines over government regulations. ED MARKEY: The grandparents, the gamers, the gearheads, the geeks, the GIF-makers, the Generations X, Y and Z - this movement to save net neutrality is made up of every walk of American life. DAVIS: Net neutrality is the principle that Internet service providers offer a level playing field for access. They can't influence loading speed or block access to websites or apps. In December, the Republican-controlled FCC voted to roll back Obama-era net neutrality rules. Colorado Republican Senator Cory Gardner runs the 2018 GOP campaign operation. And, like most Republicans, he supports shifting power away from the government and towards the private market. CORY GARDNER: If the Democrats want to run on regulating the Internet, I think that's a losing strategy. DAVIS: This issue doesn't cut cleanly along party lines. Steven Kull runs the Program for Public Consultation at the University of Maryland, which has studied public attitudes on net neutrality. They found that majorities of Americans support government-mandated net neutrality protections. STEVEN KULL: People are on the Internet a lot. And that's a big part of the daily experience. And the prospect that it will be changed in some fundamental way is disturbing to quite a lot of them. DAVIS: And fear is a great motivator for voters. Senate Democrats believe their resolution - getting every Democrat on record in support of net neutrality and most Republicans on record against it - can turn what was once considered a wonk issue into a wedge issue this November. Here's Hawaii Democratic Senator Brian Schatz. BRIAN SCHATZ: People underestimate the passion of Internet voters at their peril. They are mad. And they want to know what they can do. And this vote will make things crystal clear. DAVIS: Republicans like Congressman Scott Taylor of Virginia think Democrats are wrong on the policy of net neutrality. But he concedes that Democrats have done a better job of selling their message to voters. He warns there could be consequences if Republicans don't engage more directly with voters on an issue that matters to them. SCOTT TAYLOR: So it's important that Republicans have a clear and concise message to tell them why net neutrality, while it sounds good and maybe it's even well-intended, is not the right answer for them. DAVIS: Net neutrality doesn't make for catchy campaign slogans, but there are indicators that voters are clocking this issue. According to data provided by Google, net neutrality regularly ranks among the top political searches in each state this election year. Google has primarily supported net neutrality. In Pennsylvania and Nebraska, which held primary elections on Tuesday, it ranks second behind health care. Here's Maryland Democratic Senator Chris Van Hollen. He runs the Democrats' 2018 campaign operation and says Republicans are miscalculating how much voters care about this issue. CHRIS VAN HOLLEN: This is one of those areas where Washington, D.C., sometimes gets in a bubble and doesn't recognize what's going on in the rest of the country. DAVIS: Steven Kull is skeptical that net neutrality will be a voter motivator this year unless people see changes to their Internet costs or access. And voters may know soon enough. The Obama-era net neutrality rules expire June 11. Susan Davis, NPR News, the Capitol. Transcript provided by NPR, Copyright NPR.